Celebrate Independence for the REDS, White & Blue! Texas STAR Tournament on Sept. 1st, 2014. The prize package will include a Limited Edition All Star Team Series Rod, Abu Garcia Revo S Baitcast Reel, Berkley Trilene XL fishing line, Gulp Alive Bait and Berkley tackle bag. This fine collection is bound to enhance your skills even further. Berkley Gulp, Gulp Alive baits and Abu Garcia Revo Reels are available at Academy Sports + Outdoors, another proud partner of CCA Texas STAR tournament. You can see the display there. 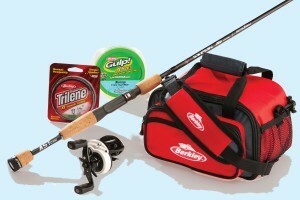 We thank Berkley and Abu Garcia for their continued partnership with us in the spirit of CCA’s mission. We all want to put something back into the water for everyone.